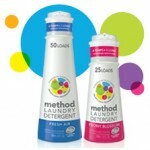 Method Laundry Detergent: $4/1 Coupon & $0.98 at Babies R Us! I was just about to post this coupon when I saw that Shannon got an email from one of her readers about a fantabulous deal on this! Final Cost: $0.98 each after both coupons! That is by far the best deal I have seen! I couldn’t print the $4 coupon either.. and the BRU coupon expired on 2/20… so sad!